For a while now, I have been thinking about featuring the ways other people interpret and use my patterns. I started this website because I wanted to share the “Look at what I made!” moments that make us feel like little kids again. 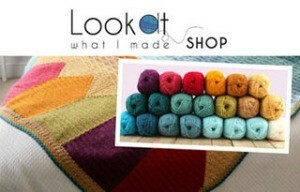 What better way to honour that than by celebrating YOUR lookatwhatimade moments? Just for the record, from here on out, I will refer to those as LAWIM moments because I’m not going to type it all out every time! 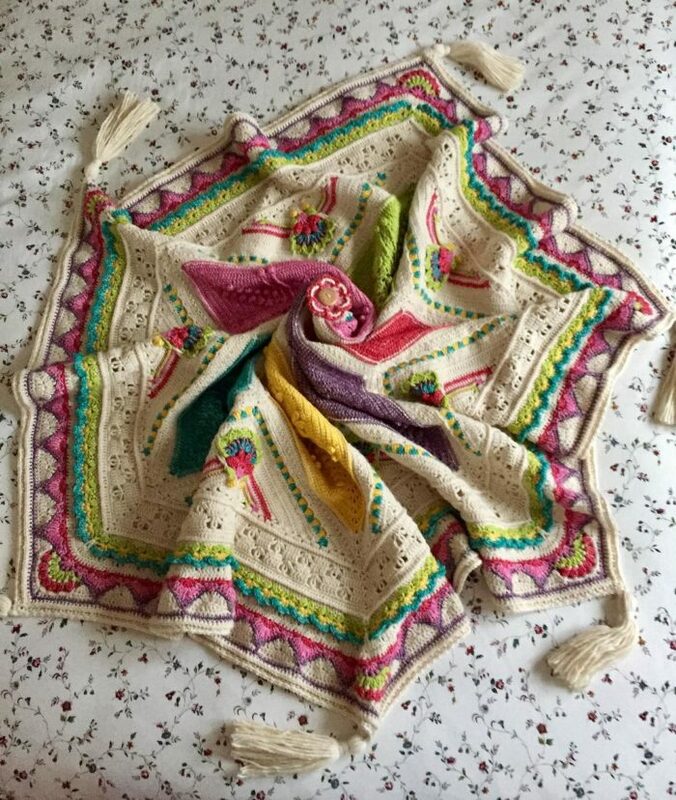 My first LAWIM Feature is this gorgeous Emma Blanket made by Hazel Raven. 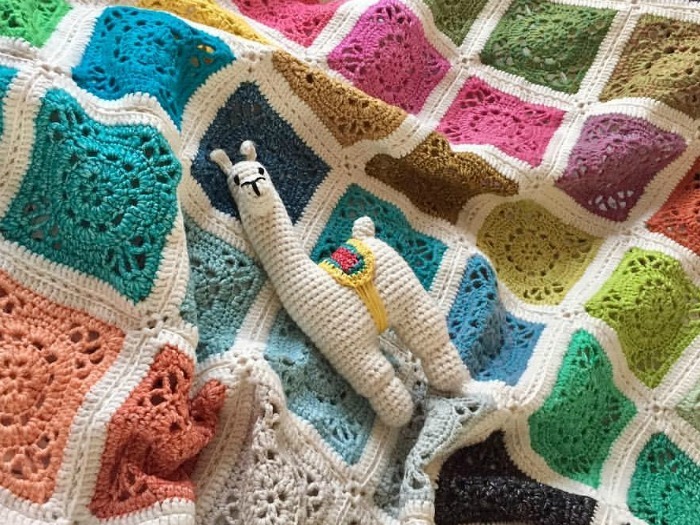 There isn’t an official pattern for this blanket, only for the squares, but Hazel has kindly shared some information that will help you recreate it, should you wish to. 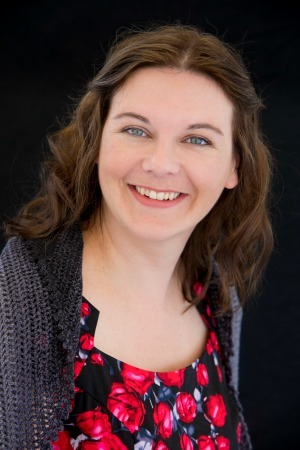 Hazel Raven is a well-known author and avid crocheter. 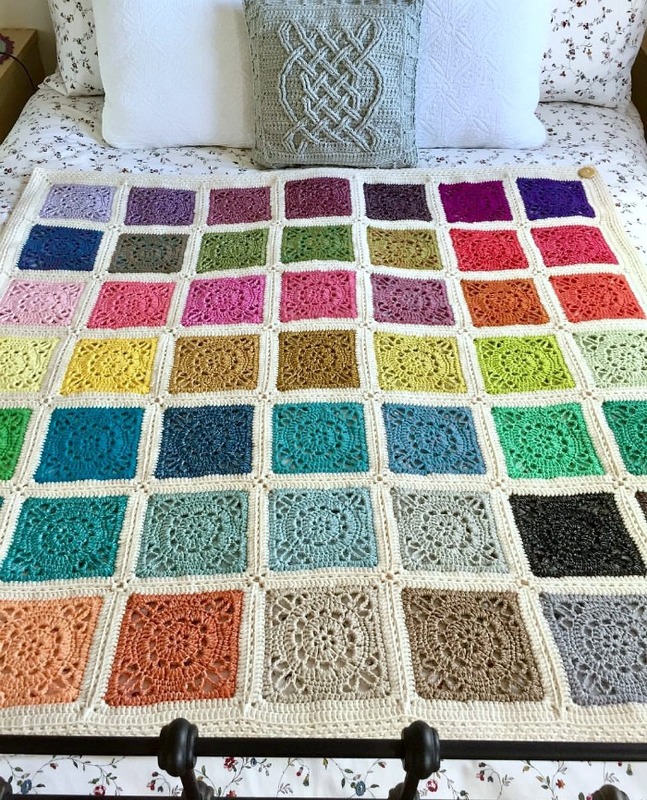 I have been following her crochet journey for more than a year now, and always enjoy seeing photos of her projects. I am very pleased that she has agreed to be my first featured maker. 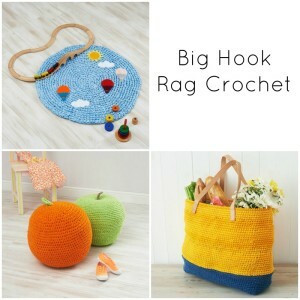 You can see some of her crochet projects HERE on Facebook. 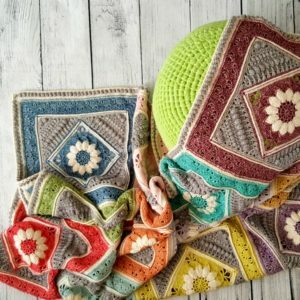 You can also see her projects HERE on Ravelry (including the gorgeous Happy Little Tree blanket that uses the regular Stonewashed/Riverwashed colour pack). I designed the Emma Square in honour of a friend of mine who has shown remarkable courage in the face of adversity. 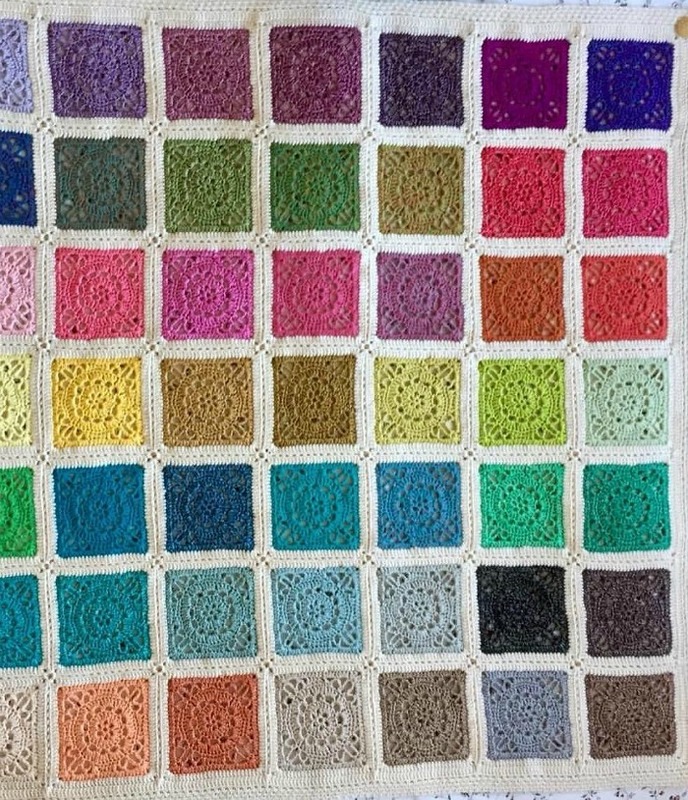 It was designed for my June 2017 Devon Sun Yarns Retreat and was also used as the gauge square for the Scheepjes Ubuntu CAL 2018. 4mm crochet hook (US 6/G UK 8) – to obtain the gauge needed for the Emma Square when using these Cutie Pies. You might find that you need to use a different hook (see Emma Square below). You will need to make one Emma Square (up to Round 7 only) in each of the colours included in the pack (not including Moon Stone). Please note that personal gauge will play a big part in the hook size you choose to use. 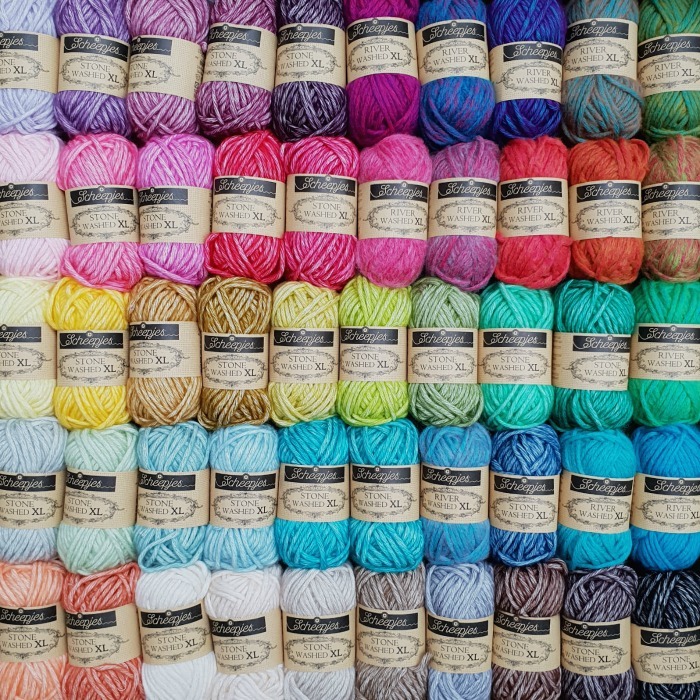 Because you are using a colour pack with small amounts of yarn for each colour, you want to make sure that you will have enough yarn to complete each square in colour up to Round 7. When I make my Emma squares with XL, for example, I can use a 5mm hook to get 7 rounds done, with a size of 14cm/5.5″ at the end of Round 7. 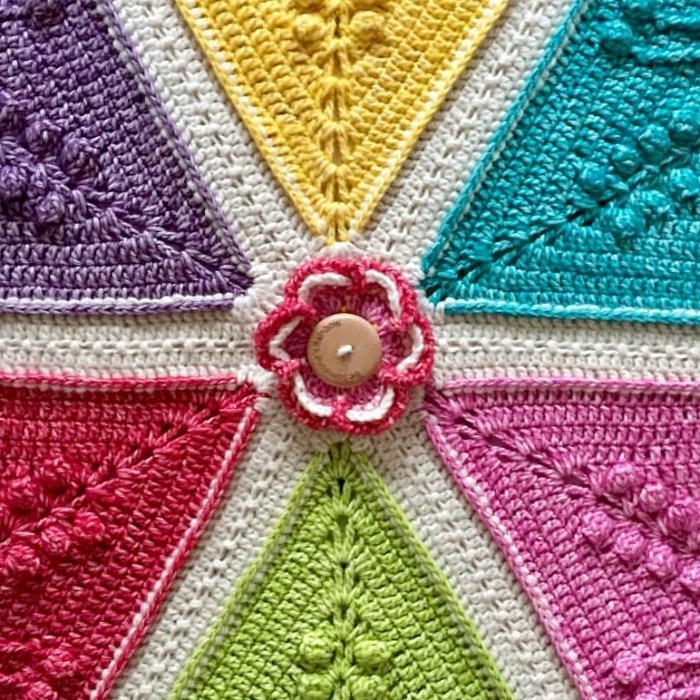 When Hazel made hers, she needed to use a 4mm hook to obtain the same gauge and ensure she didn’t run out of coloured yarn. I suggest using your first square as a gauge square to make sure that you are using the hook size that will allow you to maximise your yarn usage without running out. Once you have made the first 7 rounds of each Emma Square, make Round 8 of each square in Moon Stone. Fasten off and work away your ends. You should have 49 squares in total. 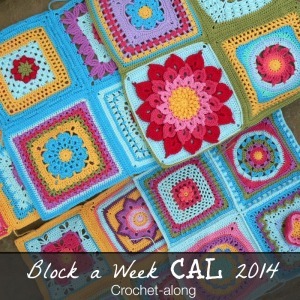 Hazel blocked the individual squares, but you don’t need to if you don’t want to. For the layout, Hazel placed her squares in a 7 x 7 grid, following the same layout as the colours in the box (see photos below). To join the squares, she used Moonstone and the (sc, ch 1, skip 1) join that we used for Ubuntu, BUT working into the back loops only along the sides. Please note that the squares are joined with right sides facing each other, so you will need to identify your back loops carefully. The square closest to you will have its back facing you, so the back loop of each st of the last round will actually be the loop closest to you. The square behind it will have its front facing you, so the back loop of each st of the last round will be the loop farthest away from you. When you open your work up and pull the squares slightly apart, you will notice the helix-like pattern created by working into the back loops. The front loops should form a line on either side of the join. 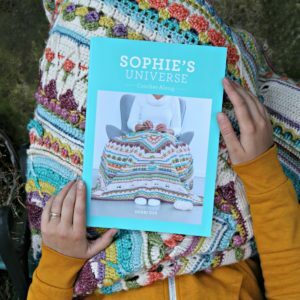 If you need photographic help identifying the loops, please have a look at Lucy’s slip stitch join tutorial HERE. 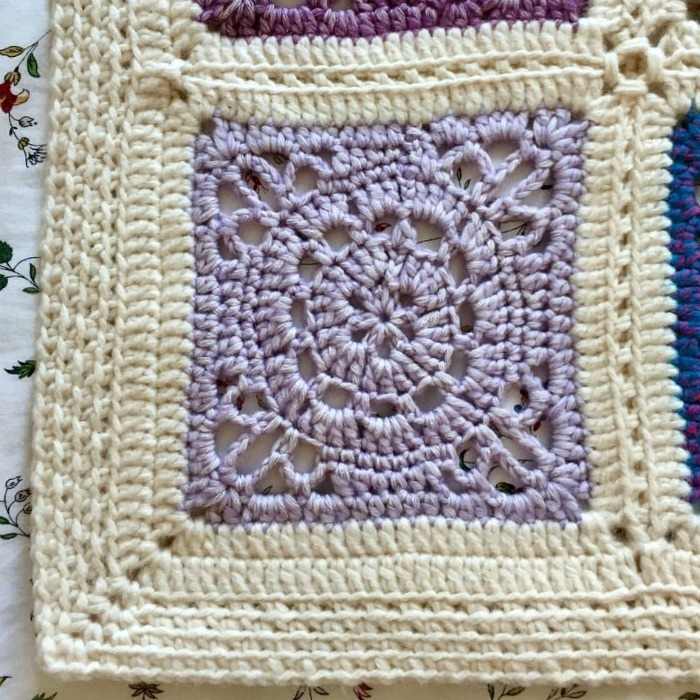 Once joined, she bordered all the squares with a round of US dc in Moonstone, making (2dc, ch 2, 2dc) in the corners and working into every st and sp along the sides. She followed this by doing 4 more rounds of linen stitch in Moonstone, working into the blo of each ch instead of into the actual ch-1 sps between sc sts. If you need help making the linen stitch, have a look at the instructions for Round 2 of the Linen Stitch Border I used for Summer in Swanage (you will have to scroll quite a way down). If you need some tips for making the corners neater when working in a single colour, please have a look at my Regular Linen Stitch Square. Please remember that both those tutorials tell you to work into the actual ch-1 sp and for this variation you want to work only into the back loop of each ch-1! The finished blanket is 116cm x 116cm (46″ x 46″). 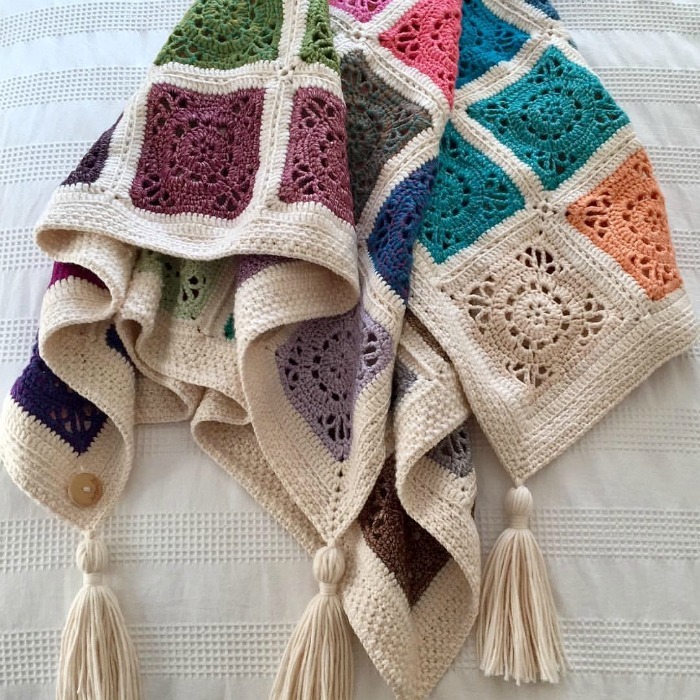 … and 4 large tassels – one in each corner. 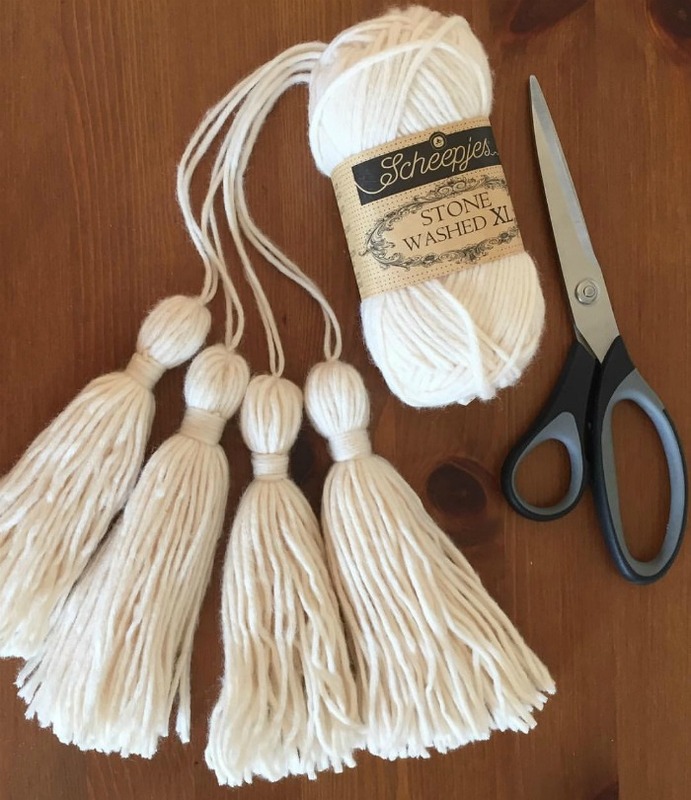 If you need some help making tassels, you can follow the instructions (and Photos 1 – 10) of the Drawstring for Aunty Mary’s Thing HERE. For the first step, use only 1 strand of Moonstone roughly 30cm/12″ long. Make your slip knot 10 cm/4″ away from one of the ends. Please remember that the XL yarn is a lot thicker (and the tassels a lot longer) than the yarn I used for the tassels on Aunty Mary’s Thing. 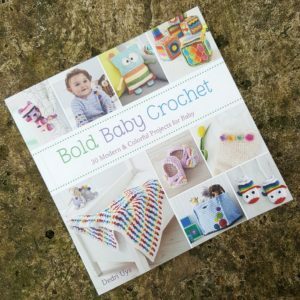 You will need to wrap your yarn lengthwise around a book instead of around your hand, so that your tassels will be long enough. When you have made each tassel up to the end of Photo 10, use the 20cm/8″ end to sew the tassels to the corners of your blanket. 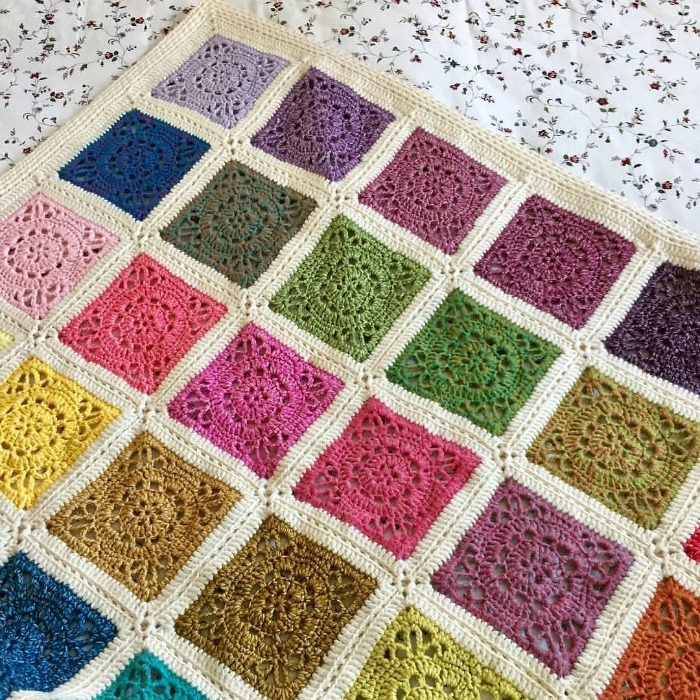 And there you have it: Hazel’s gorgeous Emma Blanket! You can find Hazel’s own notes HERE on Ravelry. 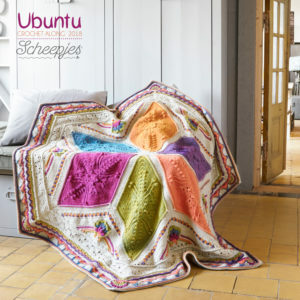 Not only has Hazel made this lovely blanket, but she has also just completed her Ubuntu in the Medium colourway. You won’t be surprised if I tell you that she added tassels to that one too! 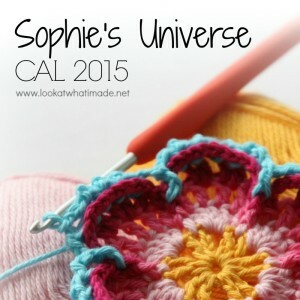 My favourite thing about her Ubuntu is the fact that she included the central flower from Sophie’s Universe in the centre of her blanket before adding her button. You can see more photos of Hazel’s Ubuntu HERE on Instagram. And ‘just because’, I thought I would share this cute little Alpawak she made using the same colours as her Ubuntu. Isn’t it cute? 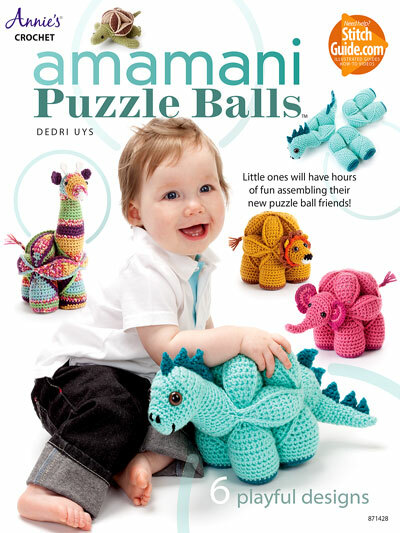 The pattern is a free one from We Are Knitters and you can find it HERE. 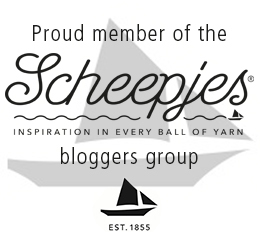 You can also add it to your Ravelry Queue HERE. 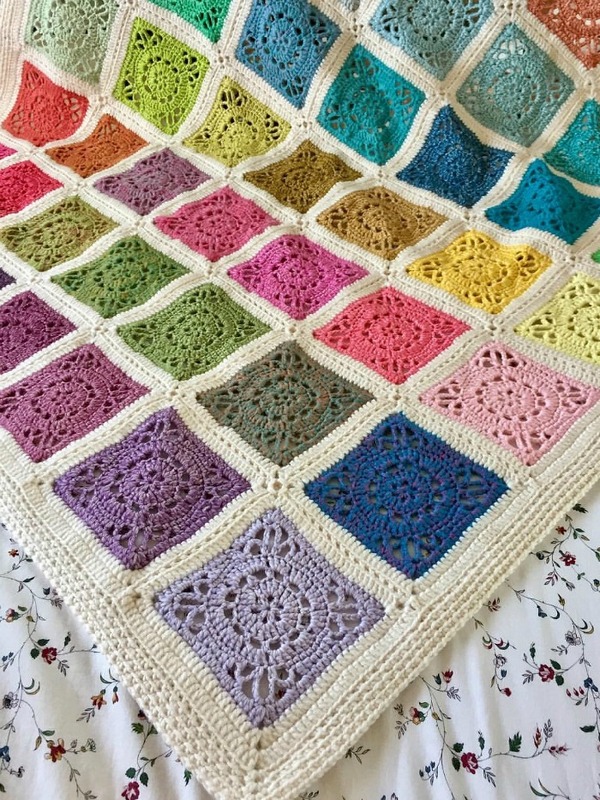 I would like to thank Hazel for letting me feature her beautiful blanket, and I hope that you will be inspired to try it yourself. Ps. 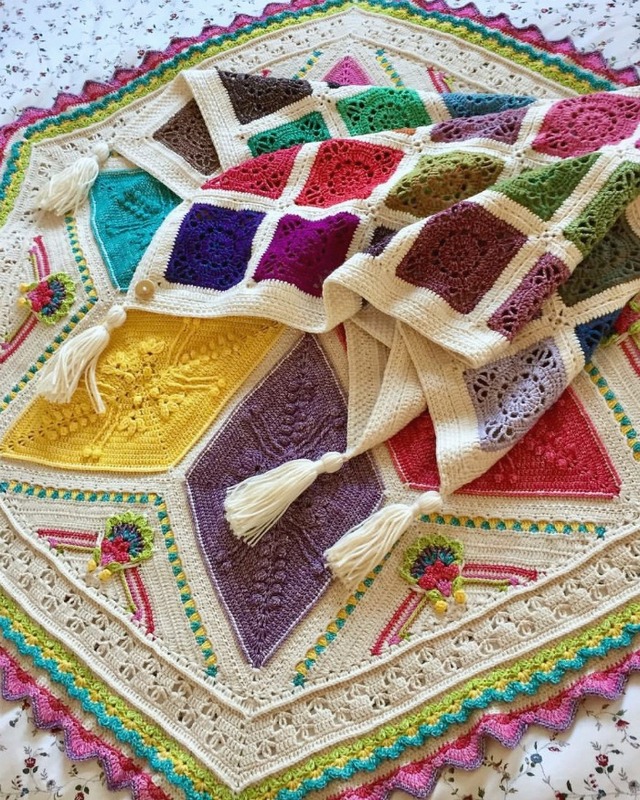 My friend Minno also made a beautiful Emma Blanket using Catona and the Banksia Border. You can see it HERE on Instagram. This blanket is just stunning! Thank you for sharing!! 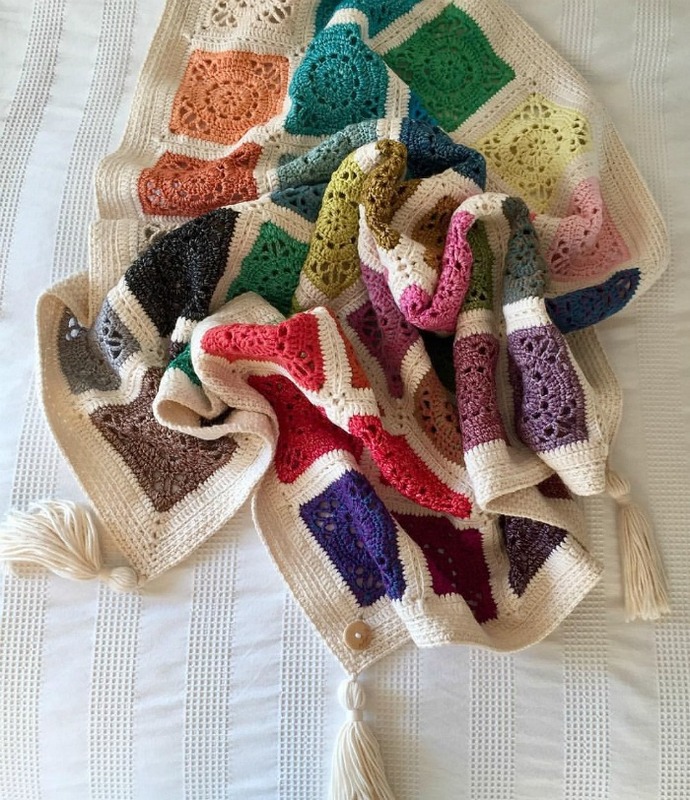 I am so grateful that I signed up to your blog and that you featured this afghan. I am part of an afghan CAL in NZ and was struggling to join them up. I absolutely love the way this join is done. I’ve tested it out and I think it will be perfect. 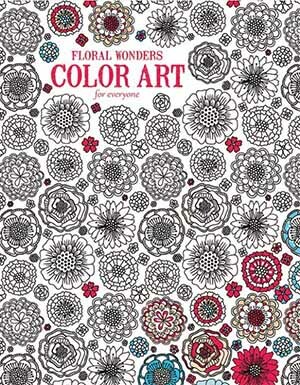 I love your patterns and I appreciate that you do so much work to create them and then they are free. Its just amazing. A huge big thank you. I’ve seen Hazel’s work on Facebook and it is beautiful. She is so prolific and uses colour in such a clever way. Wow! That is gorgeous! I want to make one now. Maybe I should finish some of my ongoing projects…. My GF and I had this discussion just the other day. She asked if it was ok to start another project when she already had so many on the go. My response was, you’re asking me and I rattled off the many projects I have going. What’s one more, ha ha. I thoroughly enjoy your blog and patterns, thank you for doing what you do.